For some CEOs it is almost a badge of honor to survive — and thrive — under extreme pressure. After all, they have attained their stature by not only having the vision but being willing to put in the effort to make it a reality. They may not even consider what they do as “work.” But other parts of life require attention, too, and failing to invest in them may not only imperil health and disrupt relationships, it could also ultimately negatively impact the effectiveness of the leader. 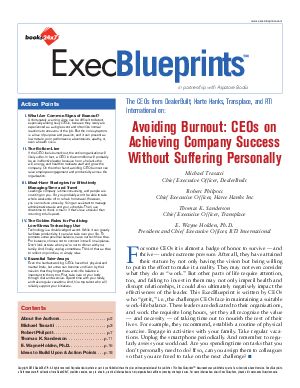 This ExecBlueprint is written by CEOs who “get it,” i.e., the challenges CEOs face in maintaining a suitable work–life balance. These leaders are dedicated to their organizations, and work the requisite long hours, yet they all recognize the value — and necessity — of taking time out to nourish the rest of their lives. For example, they recommend, establish a routine of physical exercise. Engage in activities with your family. Take regular vacations. Unplug the smartphone periodically. And remember to regularly assess your workload. Are you spending time on tasks that you don’t personally need to do? If so, can you assign them to colleagues so that you are freed to take on the next challenge?